A Place at the Table by Susan Rebecca White is the kind of novel that stays with you long after the last page has been turned. It's a brilliant slice of life about the genteel South and the bustle of New York City, a coming-of-age story that touches on self-actualization and the oft-tender topics of slavery, homosexuality and race. 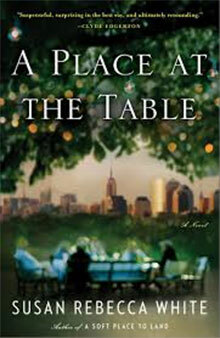 As the book description reads, "From Susan Rebecca White, award-winning author of A Soft Place to Land and Bound South, comes a breathtaking story of three richly nuanced outcasts whose paths converge in a chic Manhattan café as they realize they must give up everything they thought they knew to find a home at last." At its center, A Place at the Table shares a love story with food, and explores how that connection shapes life through the years. 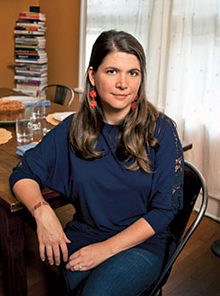 EmoryWire sat down with the author to explore our shared love of food. EmoryWire: In A Place at the Table, we read about a “Juneteenth Cake” with fresh coconut and its milk. Historically, Juneteenth celebrations were held to commemorate the end of slavery. Like chocolate hearts on Valentine’s Day and roast turkey at Thanksgiving, certain foods are often associated with specific celebrations. Can you share your thoughts on how foods become part of tradition? Susan Rebecca White: A coconut cake made with real coconut, where you use both the grated flesh and the milk inside, is quite an undertaking. Just cracking open a coconut can be difficult. My thinking was that such an auspicious occasion as Juneteenth, i.e. the commemoration of the end of slavery, mandated out-of-the-ordinary food. This is not a chess pie or a Taylor pie occasion (pies that can be easily made with everyday ingredients); this is a celebration of something extraordinary, similar, I suppose, to the grand meals people cook around Christmas. A coconut cake also mandates that you have free time to dedicate to the making of something unnecessary but lovely. Slaves did not have this freedom, but free people, emancipated people, do. There's a parallel here to the tradition of reclining against a pillow during the eating of Passover Seder; the slaves in Egypt could not recline, hence the Jews celebrate their freedom by doing so. EmoryWire: Bobby shares his experience of eating his grandmother’s pound cake. He says, “Eating my slice was like communion, Memaw. You were in the sweetness of that cake. I could taste your love when I ate it.” We all have experienced that type of sensory reminiscence. Why do you think the link between food and special memories is so strong? Susan Rebecca White: I have a seven-month old, so my mind immediately turns to nursing - how the first way we show our dedication to our children is to feed them from our body. It works with bottle feeding, too, actually. My husband has given our baby his fair share of bottles and with each one their bond grows. The baby quite literally needs the milk in order to survive. He also enjoys it. So we start off associating food with love, and for some of us food continues to be one of the most powerful ways we show our love. The first thing I do when I find out that a friend is sick, or had surgery, or suffered a loss, is to cook for them. I might not have words to show my support - or the words often seem empty - but food is tangible, food is necessary, and food comforts. Sweet food in particular can make us feel loved. I recently read of a church (in Lauren Winner's memoir, Still) that serves homemade crackers baked with honey for communion to show, on a visceral level, that Jesus is sweet. EmoryWire: In cooking for strangers, Bobby wonders about the dishes he will serve. He says, “It’s an important nostalgia. If I could find grits somewhere, I could make Mama’s casserole, with cheese and garlic, serve shrimp on top, dress it up with some basil cut in a chiffonade, give it a fancy name and call it corn and crevettes, and serve it forth to the New Yorkers who will have no idea what they were eating, who will have no idea they are eating my loneliness, transformed.” That’s a powerful statement about the emotional connection we have to our food. Can you elaborate? Susan Rebecca White: I think that in this passage I am talking as much about the transformative nature of art as I am the emotional connection to food. The emotional connection is there of course, but I when I wrote this section about Bobby transferring his loneliness into delicious food, I was thinking about how my own writing is, in many ways, a space to explore and reckon with the ways I have been hurt and have hurt others, and how I then transfer that into something pleasurable to read. I wrote this book in the middle of a divorce, and in the middle of looking at truths about my own family that I had avoided dealing with for a long time - a process of demystification that in many ways finally let me grow into an independent adult. I had a lot of hurt I was wrestling with. And I guess it occurred to me that art is the process of taking that hurt and manipulating it into something that is pleasing for others to consume, much the way that Bobby's shrimp and grits would satisfy the New Yorkers. EmoryWire: Thank you so much, Susan. We look forward to reading your next book and to enjoying your creative writing classes again at Emory! Editor's Note: I learned a trick to share with you. To crack a mature coconut for your own special cake (if you don't need the water inside), place the coconut in a plastic grocery bag, twist the bag closed, then smack the bag on the ground. The coconut should open with the first blow. Alternatively, if you need the water, locate the trio of spots on the coconut's end, tap each with a sharp device like an awl or screwdriver to open the holes and drain the water before cracking. For quickest results, drill into the holes. Enjoy! To read more about Susan Rebecca White, please visit Emory Magazine.